Meeting Report on Hull & Machinery Claims - Reasonable Cost of Repairs presented by Mr. George Kastanas, Founder / Director of Hellenic Marine Adjusters S.A. at the Greek Section’s Technical Meeting on November 23rd, 2017. During the Greek Section’s third technical meeting for the 2017-2018season on November 23rd, 2017 Mr. George Kastanas, Founder / Director of Hellenic Marine Adjusters S.A., made a presentation on Hull & Machinery Claims - Reasonable Cost of Repairs. The presentation focused on items of expenditure that are considered as part of the reasonable cost of repairs and claimed under the Hull & Machinery policies of insurance of the vessel. Such items include removal expenses, temporary repairs, in case of tankers cost of gas freeing/tank cleaning, drydocking dues and general services, supply of spare parts, including air transportation, fees and expenses of Shipowners Superintendent and Classification Surveyor and others. A Q&A session succeeded the presentation. 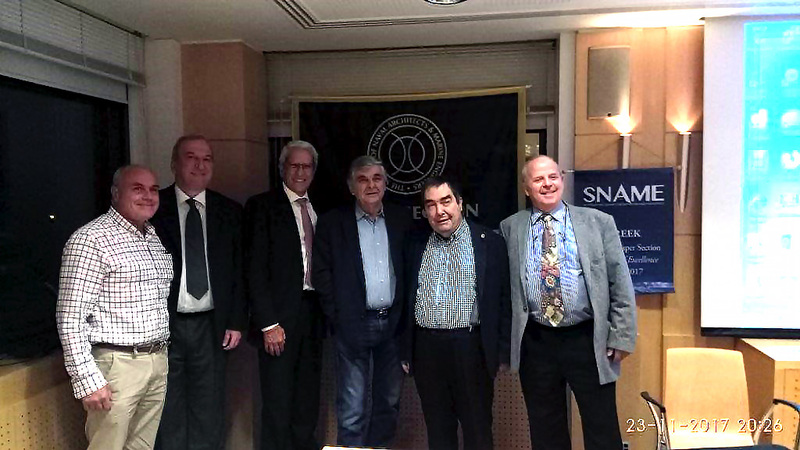 During the post-meeting reception attendees had the chance to meet SNAME President, talk to representatives from all segments of maritime industry, discuss and share their ideas. The meeting was attended by thirty (30) members, eighteen (18) non-members and media representatives. It was also broadcast to SNAME members worldwide.